Modification, characterization and valorisation of South African industrial wastes, by-products and minerals. Depending on the raw material studied and the intended application, this may include studies on solid-state thermochemical reactions, solid-liquid conversions, wet and dry surface modification techniques as well as a variety of leaching studies. Specific emphasis to the fields of Thermal Analysis, Solid State Chemistry and Surface Characterization. The techniques that are mostly applied are thermogravimetry (TG), differential scanning calorimetry (DSC), X-ray powder diffraction analysis (XRD), X-ray fluorescence (XRF), Scanning Electron Microscopy (SEM), Transmission Electron Microscopy (TEM), FT-IR spectroscopy, Raman spectroscopy, particle size distribution (PSD), surface area determinations (BET) and various wet chemical methods. G. du Toit, E. Kearsley, J. M. McDonald, R. A. Kruger, E. M. van der Merwe (2018) Chemical and mechanical activation of hybrid fly ash cement. Advances in Cement Research, 30(9) 399-412. Linda C. Prinsloo, Elizabet M. van der Merwe and Lyn Wadley (2018) The thermal behaviour of silica varieties used for tool making in the Stone Age. Journal of Thermal Analysis and Calorimetry 131(2) 1135-1145. Elizabet M van der Merwe, Clarissa L. Gray, Barbara A Castleman, Sameera Mohamed, Richard A Kruger and Frédéric J Doucet (2017) Ammonium sulphate and/or ammonium bisulphate as extracting agents for the recovery of aluminium from ultrafine coal fly ash. Hydrometallurgy, 171, 185-190. Sameera Mohamed, Elizabet M. van der Merwe, Wladyslaw Altermann and Frédéric J. Doucet (2017) Addendum to “Process development for elemental recovery from PGM tailings 1 by thermochemical treatment: Preliminary major element extraction studies using ammonium sulphate as extracting agent” [Waste Manage. 50 (2016), 334-345]. Waste Management, 66, 222–224. Frédéric J. Doucet, Sameera Mohamed, Nicole Neyt, Barbara A. Castleman, Elizabet M. van der Merwe (2016) Thermochemical processing of a South African ultrafine coal fly ash using ammonium sulphate as extracting agent for aluminium extraction. Hydrometallurgy, 166, 174-184. Sameera Mohamed, Elizabet van der Merwe, Wladyslaw Altermann, Frederic Doucet (2016) Process development for elemental recovery from PGM tailings by thermochemical treatment: Preliminary major element extraction studies using ammonium sulphate as extracting agent. Waste Management, 50, 334–345. 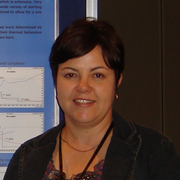 E M van der Merwe, L C Prinsloo, C L Mathebula, H C Swart, E Coetsee, F J Doucet (2014) Surface and bulk characterization of an ultrafine South African coal fly ash with reference to polymer applications. Applied Surface Science, 317, 73-83. E M van der Merwe, C L Mathebula, L C Prinsloo (2014) Characterization of the surface and physical properties of South African coal fly ash modified by sodium lauryl sulphate (SLS) for applications in PVC composites. Powder Technology, 266, 70–78. F J Doucet, T K Mlambo, E M van der Merwe, W Altermann (2014) Injection of coal fly ash slurry in deep saline formations for improved CO2 confinement – A theoretical concept. International Journal of Greenhouse Gas Control 25, 198–200. Elizabet M van der Merwe, Clarissa Gray, Richard A Kruger and Frédéric J Doucet (2017) Aluminium extraction from ultrafine coal fly ash by thermochemical processing with ammonium sulphate and/or ammonium bisulphate. Published in Proceedings of EuroCoalAsh2017, Brno, Czech Republic, 6-8 February, pp 101-106. Available online at http://www.fch.vut.cz/eca2017/ (ISBN 978-80-214-5469-9). Frédéric J. Doucet, Elizabet M. van der Merwe, Nicole Neyt and Linda C. Prinsloo (2015), Extraction of Aluminum and other Strategic Metals from Coal Fly Ash using a Novel Process and Low-cost Recoverable Reagent . In: Proceedings of the 2015 World of Coal Ash Conference, Nashville, Tennessee, USA, 5-7 May. Available online at http://www.flyash.info/2015/099-vandermerwe-2015.pdf. Mathibela E. Aphane, Elizabet M. van der Merwe, Frédéric J. Doucet and Leslie Petrik (2015), The Effect of Sulphuric Acid Concentration on the Removal of Reactive Aluminium from South African Coal Fly Ash. In: Proceedings of the 2015 World of Coal Ash Conference, Nashville, Tennessee, USA, 5‑7 May. Available online at http://www.flyash.info/2015/073-dutoit-2015.pdf. Grizelda du Toit, Elizabet M. van der Merwe, Elsabé P. Kearsley, Mike McDonald and Richard A. Kruger (2015), Compressive Strength of Chemically and Mechanically Activated Aluminosilicate systems. In: Proceedings of the 2015 World of Coal Ash Conference, Nashville, Tennessee, USA, 5-7 May. Available online at http://www.flyash.info/2015/073-dutoit-2015.pdf. E M van der Merwe, L C Prinsloo, C L Mathebula, H C Swart, E Coetsee, F J Doucet and R A Kruger (2014), Comparison between the surface and bulk characterization of an ultrafine South African coal fly ash. Published in Proceedings of EUROCOALASH 2014, Munich, Germany, 13-15 October, pp 265-280. Available online at https://www.vgb.org/shop/tb720-14.html (ISBN 978‑3‑86875-805-4).